Aviation Nation is an annual air show and open house of the Nellis United State Air Force Base near Las Vegas, NV, held in November of each year. However, due to the defense budget cut for fiscal year 2013, the scheduled airshow on November 9 and 10, 2013 was canceled. It is exciting to see the Aviation Nation returns on November 8 and 9, 2014 with aerial demonstration between 11 a.m. and 4 p.m. There will be no Aviation Nation 2015 because an expected inspection during the same time period next year when the air show is usually held. Postcard US-2489824 to Germany shows the popular F-16 Thunderbirds demonstrations during a previous Aviation Nation event on November 14, 2010. Nellis Air Force Base is the home base for the U.S.A.F. 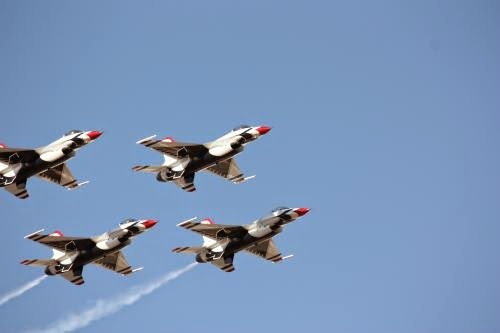 Thunderbird air demonstration team. In addition, both the newest U.S.A.F aircraft such as the F-22 Raptor and the legacy aircraft such as the World War II B-25J Mitchell "Executive Sweet" are featured.